Storify is a really nice way to create and share a summary of tweets and other online material around an event or discussion, such as a conference, blog or livechat. This Storify has been created by @shirleypickford of her experience of the programme! 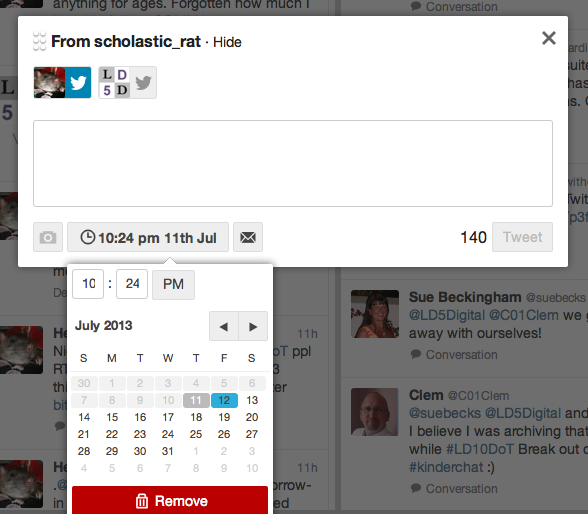 You can schedule tweets to send themselves automatically later on. You can’t do this from Twitter itself, but will need to use one of the additional apps mentioned in Days Eight and Nine, so you may wish to leave this topic for later if you want to consolidate the basics first. There’s quite a bit there to play with! Well, that’s the last of our Ten Days of Twitter, but don’t worry if you’re still catching up – so are others, and the conversation will be continuing on #ARU10DoT for quite some time, I hope! You might like to keep an eye on the programme hashtag and support academic colleagues as they learn how to use Twitter. I hope you’ve found the programme useful, and thanks for joining in! Keep tweeting! (If you’ve experimented with Twitter and decided it’s not for you, then I hope we’ve helped you come to a well informed decision on whether to use it or not. If you now want to delete your account, it’s easy to do so. We encourage you to keep your digital footprint tidy!). This entry was posted in Academic, Day Ten. Bookmark the permalink.